Every parent has their own unique parenting style, but it’s human to wonder how others handle their children. It’s also natural that we feel curious about how celeb mommies balance their professional lives and kids, given the constant press attention. We sometimes assume that celebs are a world apart and that their parenting is very different altogether. However, all parents are the same and try to instill the same values in their kids. Here we discover Kajol’s parenting style and how she balances family and work. She has two kids – one daughter Nysa and a younger son Yug. Kajol is a very private person, but recently she spoke about some of the things she makes her children do every single day. 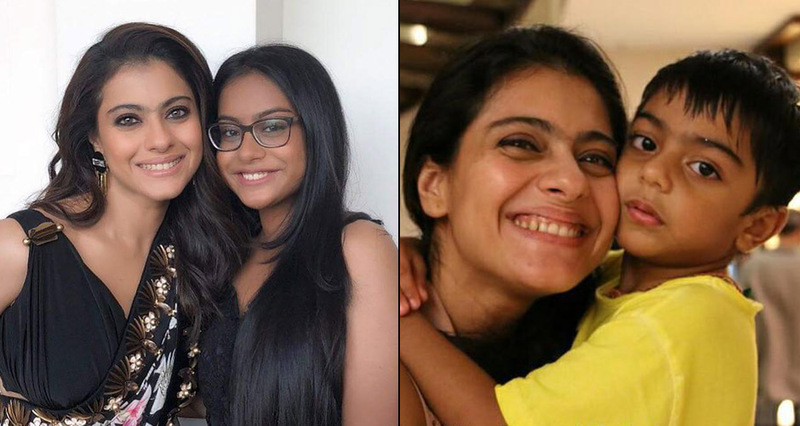 Check the out the things Mommy Kajol makes her kids do. Celebs are no different when it comes to worries about kids not eating well. Kajol is also always trying to get her kids to eat healthier, but with a twist. She does not believe in nagging about healthy food She confesses that she and Ajay Devgan make their kids eat homemade food throughout the week and over the weekend she allows her kids to indulge in whatever they want!! Parenting Lesson: Food and nutrition is a cause of worry for every parent but being super strict is not the best best way to get your child to develop healthy eating habits. Put yourselves in your child’s place and think – don’t you also enjoy junk food now and then? Let your kids also enjoy themselves once or twice a week. Kajol allows her kids to develop and express their individuality, their own tastes and preferences. Both her kids have different approaches to food. For her son Yug, food needs to smell and taste good, while her daughter needs to see a pretty plate. So Kajol tries to balance these two out, making food that tastes as well as looks good. Parenting Lesson: Each child is unique. What may have worked for one will not work for other! Respect your child’s individuality and adapt to that. Parenting Lesson: Hand washing is a very important habit for kids to learn, as it keeps them healthy. Don’t compromise on this area and make sure kids wash their hands after playing, before eating and after using the washroom. Kajol ensures that everyone – including herself, Ajay and kids – chooses fresh juices over cold drinks. She believes that it’s very important for parents to set examples by adopting the good habits they want their children to pick up. Parenting Lesson: Children are the best imitators. They learn from example, so it’s important to set the right example for them to follow. #5. Makes them understand the importance of family values and love. Nothing is more important than family. Kajol’s parenting philosophy is pretty clear when it comes to ensuring that her children value each other and their family values. She confesses to being the strict parent, letting Ajay be the fun one. Kajol explained her kids sometimes try to express their love in their own way. While her son Yug, wants to hug her every night before sleeping, her daughter tries to give her space and “me time”. True love is expressed in the little things, and that it what makes family so special, isn’t it? Parenting Lesson: Good parenting means ensuring your children feel loved and secure. Teach your children good family values and they will always come to you when they need help. Did you find Kajol’s parenting style interesting? What’s your parenting philosophy? Share below! !